An intersectional cross-disciplinary feminist group founded in 2018 to create lasting social and systemic change to achieve equality for all women. Clorama Dorvilias is the CEO of Debias VR and has worked in variety of community engagement roles in local government and the public sector. She is a UX/Creative Technologist who's built products and designed services for women survivors of trafficking, low-income job seekers, and minority entrepreneurs including Issa Rae. Currently, she creates virtual reality trainings to combat bias. She obtained a B.S. in Political Science from Santa Clara University, and an M.A. in Interaction Design from University of Arts London. Beth M. Duckles, Ph.D. is a research consultant who helps scientists, designers and technologists create and understand social data. She runs an online peer support group of women who have left academia called The Athenas. She loves writing, storytelling, Aikido and fiber arts. She received her B.A. in Sociology/Anthropology from Earlham College and her Ph.D. in Sociology from University of Arizona. You can find her online at bethduckles.com or on twitter at @bduckles. Shannon Slocum is a UXD/Product management professional who specializes in ecommerce and digital experiences in retail. She received her B.S. in Graphic Design with a minor in Business from Northeastern University. Shannon uses her wealth of knowledge in design combined with her business acumen to help organizations of all sizes better connect with their customers. You can find Shannon online here. Rebecca Hyman is a therapist, and previously was a tenured English and Women’s Studies professor. She has taught in the School of Social Work and Family Studies Program at Portland State University and at the School of Education at Lewis and Clark. She brings a focus on language, interpretation and meaning to her work and she has a particular interest in helping people succeed in academic and creative pursuits. She is currently writing a book about posttraumatic stress disorder. Jane Carr is an educator and PhD candidate completing her dissertation on holistic civic engagement. 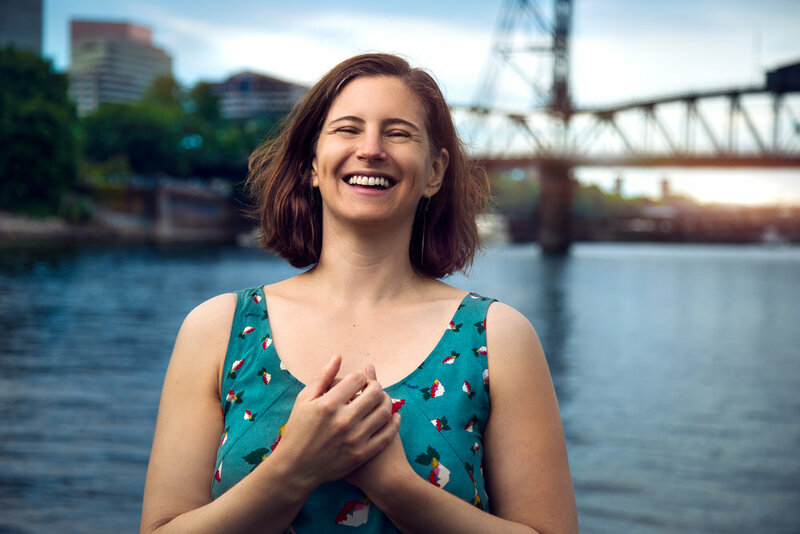 She teaches popular courses in civic leadership at Portland State University, and has also taught in New York City public schools, rural Paraguayan girls’ leadership workshops in the Peace Corps, and trainings on cultivating energetic boundaries and grounding. She holds a MA from Bank Street College of Education and a BA with high honors in History from Harvard College. Sara Carbonneau is an acupuncturist and futurist who is fascinated by the way in which technology influences our social behavior and what it reveals about our hopes, dreams and fears for the future. As a healer, she believes in working with people to strengthen their relationships and to use rituals that encourage their growth and vitality. She is passionate about storytelling, Argentine tango and fashion. She received her B.A. in Writing at Sarah Lawrence with a focus on Environmental Studies and Philosophy and her Masters of Chinese medicine at OCOM. Sign up with your email address to receive news and event announcements from the Alevare Collective. I want to be a subscriber! Thank you! We have received your submission. We will be in touch.